There are longer loops that include Overall Run, but this 4.8 mile route hits the key notes with fairly minimal effort. 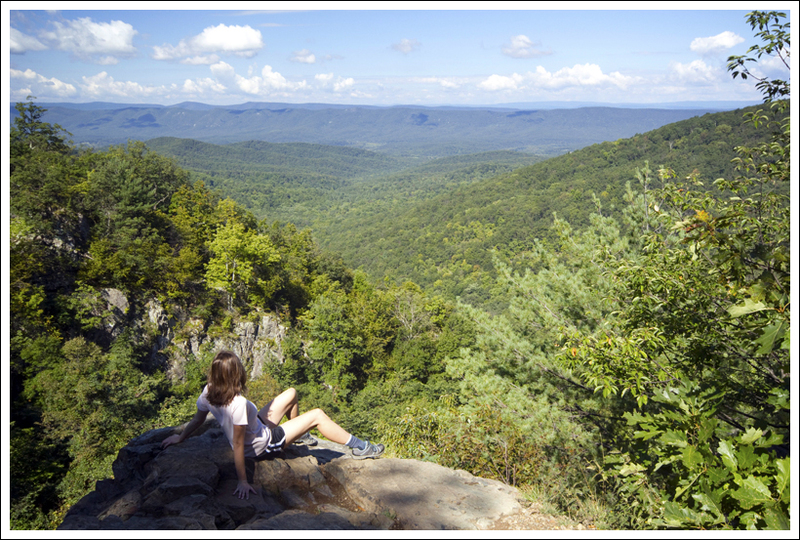 Overall Run Falls is the tallest waterfall in Shenandoah National Park (93 feet), but the best part of this hike is actually the spectacular view overlooking a gorge with open vistas facing west. Adam enjoys the western view from Overall Run. Below: Adam walks along the Tuscarora Trail; The first waterfall on Overall Run was pretty much non-existent; The return route on the hike took us through Mathews Arm Campground. 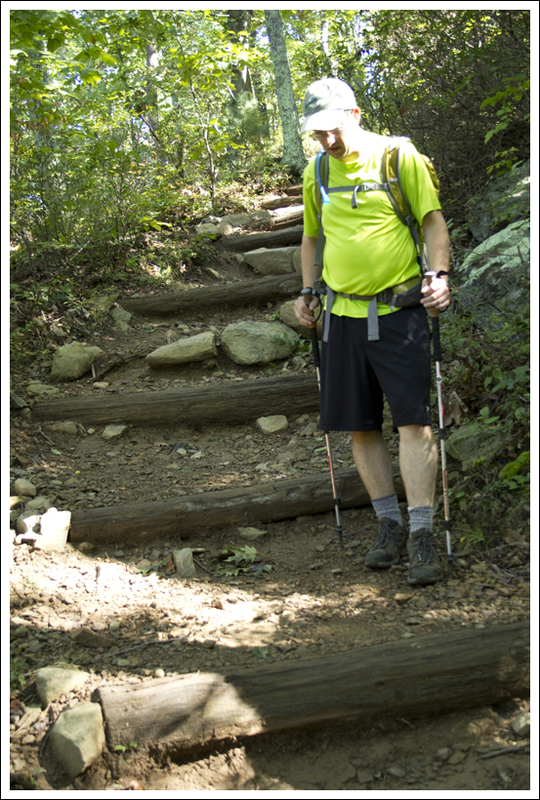 Well… here we are – finally back to Virginia hiking! For a website that focuses on Virginia hikes, we really haven’t done many ‘home-state’ hikes lately. Part of it was finding time to hike with a busy schedule, but even more at fault was the dreadfully hot and stormy summer. I’ll admit, I’m not a summer person. I wither in the heat and humidity. I loathe bugs, especially mosquitoes and ticks. There were so many days that we passed on hiking just because we didn’t want to endure the heat. Fortunately, over the last few weeks, summer seems to be fading away. There’s been a snap of fall in the air. Summer haze is evaporating, leaving skies crisper and clearer. Nights are dipping down into the fifties (we hit the forties a couple times last week). Even the ridgelines atop the taller peaks are started to fade to a rusty green. Autumn is just around the corner, and I couldn’t be happier! On one of the first ‘fall-ish’ days in September, we decided to hike down to see the tallest waterfall in Shenandoah National Park. I’ve hiked just about every trail in the park, but somehow I’ve never gotten around to hiking Overall Run. It’s one of those hikes that’s been on our to-do list forever, but keeps getting bumped for other hikes. Overall Run is notorious for slowing to a trickle during dry periods, but we were coming off a very rainy/stormy week, so we figured it was a good time to see the falls with a decent volume of water. Adam climbs down the one steep section of the hike. 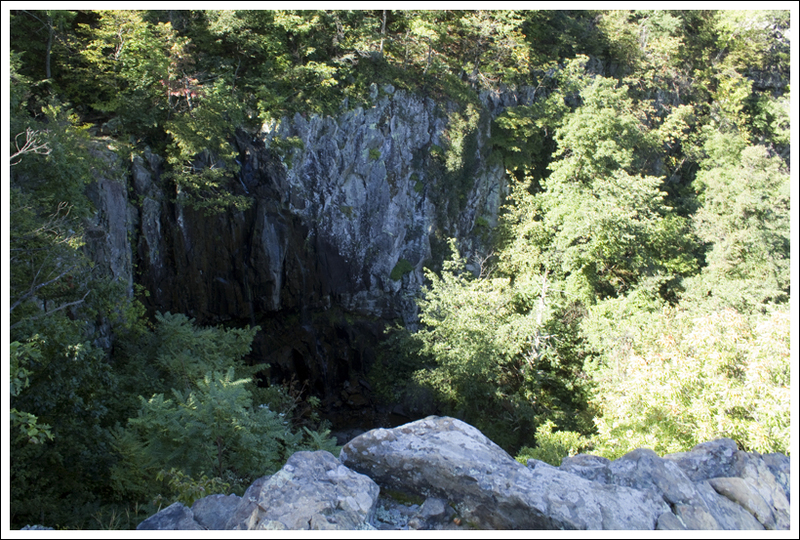 Below: This gorge is home to Shenandoah’s tallest waterfall – Overall Run. When we visited, there was almost no water running; Christine enjoys the view; We enjoyed the view with LOTS of other people. We started out at Mathews Arm, in the parking lot adjacent to the campsite check-in station. We followed the Traces Trail for a short distance until it met the Tuscarora/Overall Run trail. The trail descended gently through the woods. There was nothing exceptional along the way – just pretty, quiet forest scenery. Eventually, the trail dropped steeply down a set of log steps set into the trail. Right before the descent, we saw a shirtless guy sitting in a tent, about ten feet off the trail. Seriously… if you camp in the park, shouldn’t you be far enough off the trail that everyone passing by can’t see you? At the bottom of the initial descent, we came to the first (and smaller) of the falls. It was just a thin ribbon of water through the canyon, so we quickly moved along. After one more short descent, we reached the large falls on Overall Run. It was barely a trickle, just a sheer film of water running down the canyon wall. While the waterfalls were seriously disappointing, the view was not! It was spectacular and expansive, offering gorgeous views to the west. We shared the view with lots of other people. Besides Dark Hollow Falls, I’ve never seen so many people at a Shenandoah waterfall at once. It was a little surprising. I had no idea Overall Run was so popular! We stayed for a while, enjoying the beautiful day and the wonderful view. On the way back, we intended to return the same way we arrived, but at the top of the climb after the falls, we saw a trail junction that pointed 1.5 miles to Mathews Arm Campground, so we decided to go that way. The trail took us over to Beecher Ridge, which turned into a fire road, then back into a trail, which eventually led to the back side of Mathews Arm campground. We walked through the campground and back to our car. All in all, it was a pretty hike made worthwhile by the awesome view! I’d like to see Overall Run falls running generously someday, but after doing a little digging on a couple photo sites, it seems to take seriously heavy rain or snowmelt to make the falls truly impressive. If we do this hike again, we’ll do it in the spring after there has been lots of rain! Overall Run was definitely a pleasant surprise to me. I knew about the large waterfall here, but I had no idea that the views would be so impressive. We started off our day with a big breakfast at Skyland Resort. I hit the breakfast buffet, which had eggs, bacon, sausage, french toast, fresh fruit, oatmeal, and biscuits. It was a good way to get some energy in my system for a hike, but I did feel the need to do some exercise to “earn my bacon”. After leaving breakfast, we made our way to the trailhead at the Mathews Arm campground, seeing a coyote and bobcat on the way there. We didn’t get any pictures, since both of these animals are typically very skittish and darted off Skyline Drive as soon as we spotted them. We pulled into the Mathews Arms campground, passing the fee station for overnight camping and taking a right to the large parking lot. 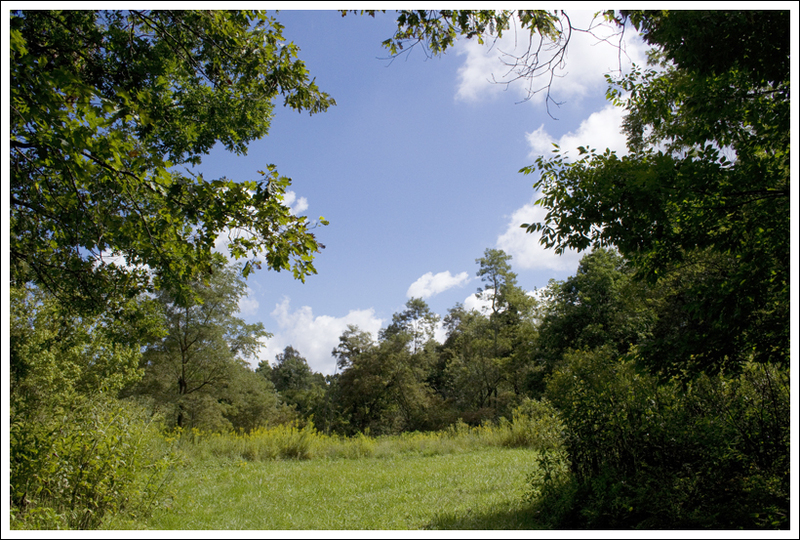 From the parking lot, we began our hike on the Traces Trail, which led into the woods. We stayed on the Traces Trail until we reached the junction with the Tuscarora/Overall Run trail at .6 miles. Take a left on this trail. 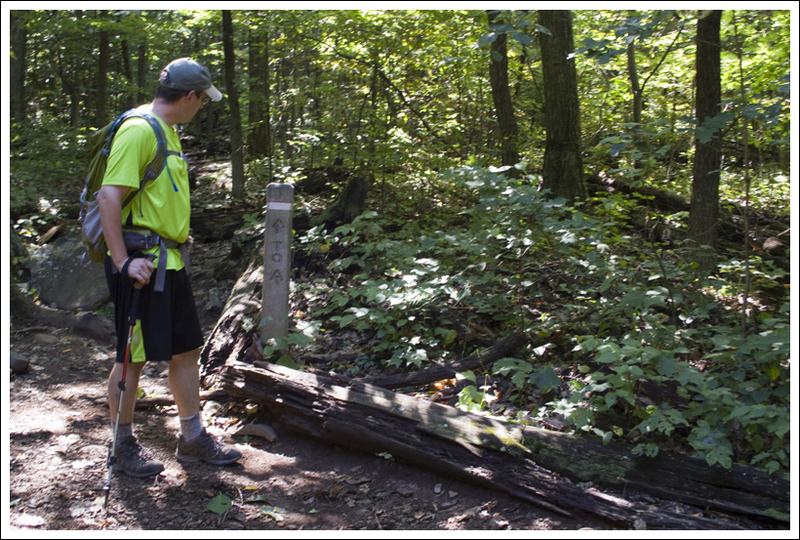 At 2.0 miles, you reach a junction with the Mathews Arm trail, which will be your return route for the loop. We continued on the Tuscarora Trail until we reached the overlook area at 2.5 miles. For the return, we went back the way we came. At 3.0 miles, we took a right on the Mathews Arm trail towards the campground. At 3.5 miles, we reached a junction with the yellow-blazed Beecher Ridge trail (more like a fire road) and took a left towards the campground. At 3.9 miles, you will reach a junction with the Weddlewood Trail, but stay straight. You will reach the campground around 4.5 miles near a restroom. Follow the road to the right making your way back to the amphitheater and parking area for your vehicle at 4.8 miles. Adam walks the trail toward Mathews Arm. Below: We came to a trail junction that pointed us back toward Mathews Arm – we decided to take it; Adam crosses a rocky section of trail near the start of the stream that feeds Overall Run; A pretty clearing along the Beecher Ridge trail. The definite highlight of the hike was the views from the overlook and I wasn’t the only one to think so. We would see people that would say, “Oh, that’s the waterfall?”, but then camp themselves on the rocks to soak in the views. There are a few different spots to enjoy the views from the overlook, but not a ton of room. 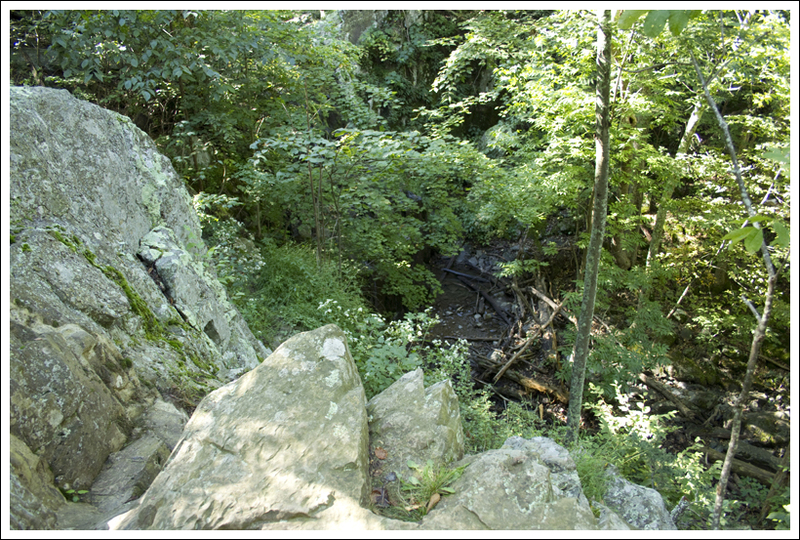 The northern district in the park tends to get a lot of visitors from the northern Virginia area and since this trail is accessible from the northern most campground, you will likely see lots of people on your hike. I climbed up some precipitous rocks and sat looking out into the canyon with views of mountain ridges for miles. Of interesting note about this hike is when you start your hike from the Traces Trail and reach the intersection with the Tuscarora Trail, the trail splits into two. 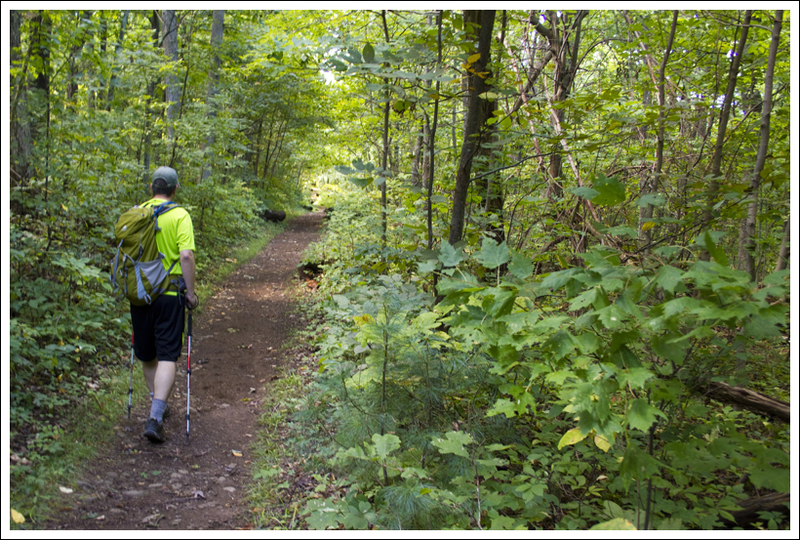 If you head to the right, you will reach the eastern terminus of the Tuscarora Trail in just a few tenths of a mile. The other terminus of the trail is 252 miles away. The area in Virginia and West Virginia was once known as the Big Blue trail. 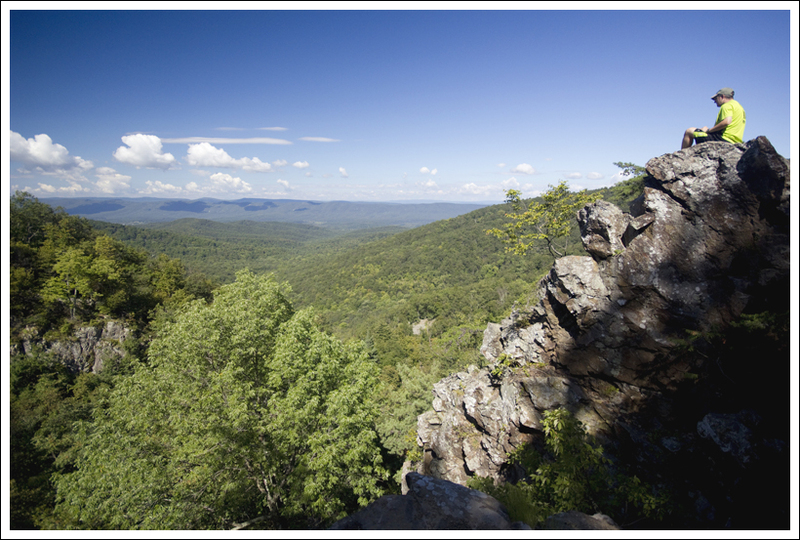 Originally designed as an alternative to the Appalachian Trail (since it connects to the Appalachian Trail at both ends), it will one day become a part of the Great Eastern Trail, connecting Alabama to New York. Difficulty – 2 This hike has only one steep section leading down to the waterfalls, the rest of the trail is flat or requires only moderate climbing/descending. Trail Conditions – 4. 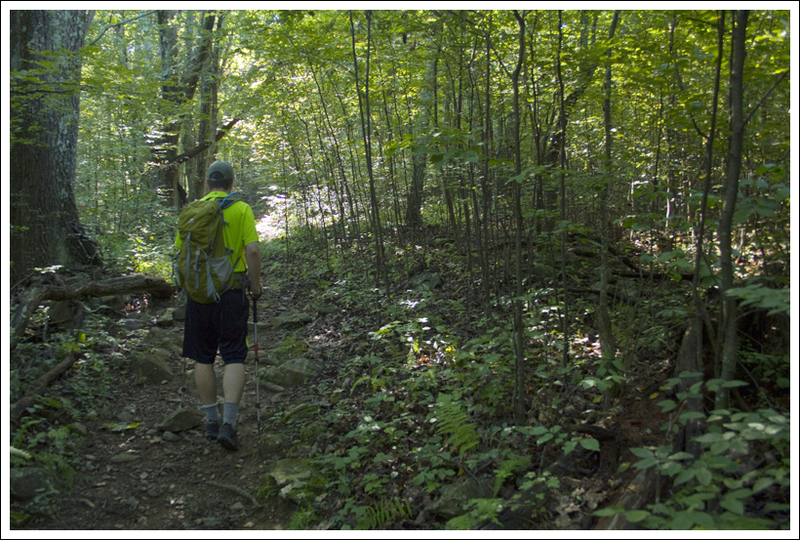 The trail is well-maintained and relatively easy to walk. Views– 4. The view at the gorge next to the waterfall is spectacular! Streams/Waterfalls – 2. There are two primary falls on Overall Run. The second waterfall is the largest in the park, measuring 93′, however, it’s not terribly impressive in volume. We started this hike to see the waterfalls, but found the view far more rewarding. Wildlife –2. We didn’t see anything on the hike, probably because the heavy hiker volume, but we did see a coyote and a bobcat on the drive to the trailhead. Ease to Navigate – 4. There are few trail options to take, but most of them lead back to the start point. As long as you pay attention, you shouldn’t get lost. Solitude – 1. We were on the trail before 9:00 a.m., but still found the trail exceedingly crowded. The overlook at the point of the largest falls had about a dozen people when we arrived. We saw many more people on the way back. We even saw one group camped less than ten feet off the trail. Directions to trailhead: Follow Skyline Drive to the Mathews Arm Campground at mile marker 22. 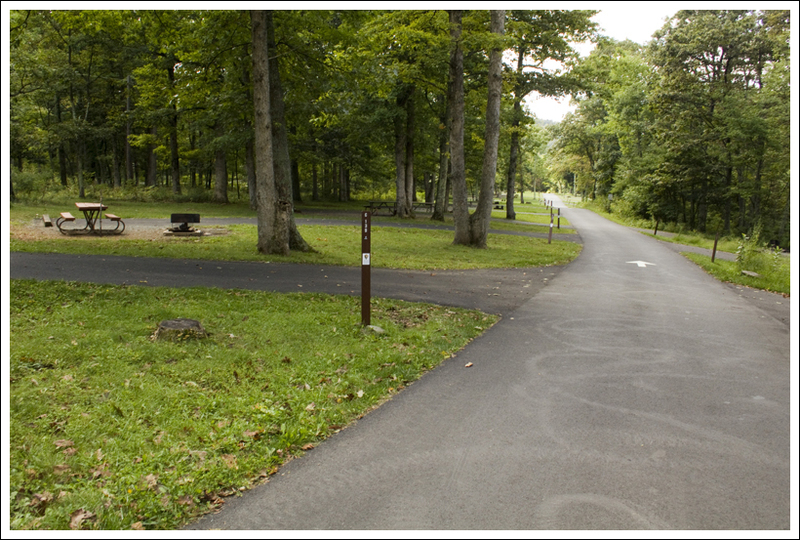 Park at the amphitheater and follow the blue-blazed Traces Trail that departs from the east end of the parking lot. This website has been very helpful! I’ve been looking for different hikes since February and have been planning to do the Matthews Arm Loop, but having second thoughts b/c I’ve been reading review that it’s boring! Thank you so much for your insight; love the honesty! I am flying up from Savannah, GA to meet a friend in D.C. and we are planing to hike from 4:00 Friday night to Monday at noon. 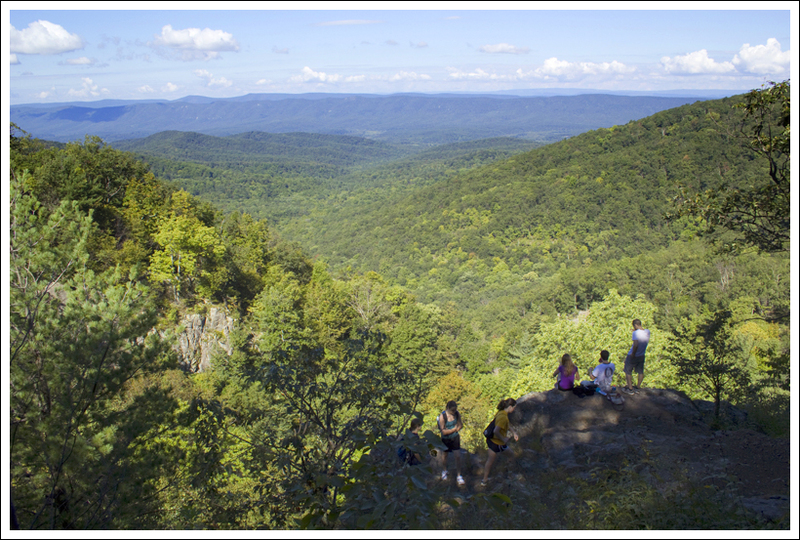 Which of the Shenandoah hikes would you say is the absolute best? We do not was anything physically extreme, but definitely want to see waterfalls and great views and get 15+ miles in over the three day weekend! Hi Sarah – for waterfalls, I would do either the Rose River Loop or the Doyles/Jones Loop. Rose River is the shorter/easier of those two. For views, I would do the out-and-back from Pinnacles Picnic area to Mary’s Rock. It’s not strenuous at all, and has some really spectacular views. 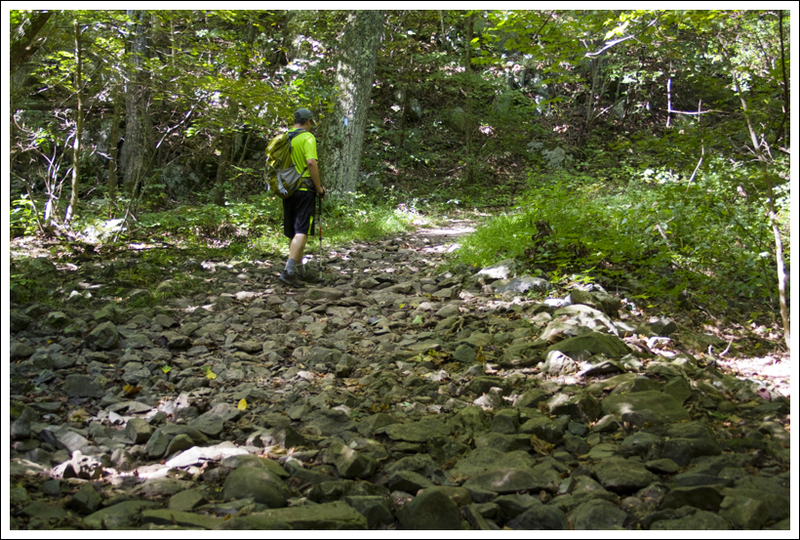 Also, if you have energy for one more, don’t miss the easy hike to the Rapidan Camp. The old presidential retreat is very interesting and the river there is beautiful! Hi all…I could really use everyone’s help on this. I hiked the Overall Run trail today Sat. 3/1/2014. We came out around 1315 and when I changed I must have dropped my money clip next to my car and not realized it. It has a Saints logo on it and approx. $800. I would greatly appreciate if any of the folks who were out there today who may have found it would be really nice and call me to return it. I shouldn’t have had it with me but stupid me I did. We ended up hiking the Overall Run Falls trail in reverse (from 340), so we actually did not reach the falls until the hike started to decline back down the mountain. The view was fantastic! The low point of the hike was losing a bracelet that my mom gave me while I was expecting my daughter 5 years ago. I am hoping that anyone reading this review and taking this hike will take a moment to look for it on your trip. In a race against the sunset, we were really booking it back down the trail after the Great Falls. This is the steep rocky part of the trail. Well, I went down and recall snagging the bracelet on my walking stick, but did not think I had broken it. It is a thin silver chain bracelet with a single silver baby bootie charm on it. My mother passed almost 5 years ago and I have worn it everyday since my daughter was born. If anyone is lucky enough to find it, you may contact me at durose419@gmail.com. I will be eternally greatful to whoever is able to return it to me! I am from the Richmond, VA area. This is interesting timing, as I stayed at Mathews Arm last weekend for the first time as a participant in the PATC’s Trail Maintenance Workshop. I hiked much of the loop you did when I had an extra hour before dinner, and was also amazed at the number of people on the trail. It definitely rivals Dark Hollow Falls in popularity! Since I only did the Matthews Arm Trail to the Tuscarora/Overall Run intersection then back up the steep steps on the Tuscarora, I missed the overlook. Now I have a reason to go back. Thanks again for your informative hiking blog guys!